Japanese maples (Acer palmatum) are trees with orange, crimson or dark green foliage. They are small trees growing to 25 feet tall and 15 feet wide. Japanese maples have a tolerance for shade and are often located in shade or partial shade. Nearly all Japanese maple trees are propagated from cuttings because Japanese maple trees grown from seed do not always carry the desirable traits of the parent tree, such as leaf color. Japanese maple trees grow best if planted in USDA horticultural zones 5 through 8. Test the soil pH around the base of the Japanese maple. The correct pH range for a Japanese maple is 3.7 to 6.5. If the soil has a pH higher than 6.5, the soil is too alkaline for the Japanese maple to survive, and soil amendments such as sulfur or an iron supplement will be needed. Carefully monitor the soil pH and gradually adjust the soil pH over several months until it is in the required range. A large application of any soil amendment can shock and kill the plant. Cut back the diseased and dying limbs to live wood, a main branch or the trunk of the tree. After each cut, wash the pruning tool in a solution of 1 part bleach to 9 parts water. This will prevent any diseases that are damaging the limbs to spread to other parts of the plant during the pruning process. Do not leave any dead limbs that may spread disease in the garden area. Remove all weeds and competing vegetation from around the base of the Japanese maple tree. Check the drainage around the Japanese maple. If the tree sits in waterlogged soil, drainage must be provided around the tree by changing the slope of the planting area, or digging a trench with a shovel so water runs away from the plant. Do not pile excess soil over the root base of the tree because the roots should remain naturally close to the soil surface. The soil around a Japanese maple tree should remain cool and moist, but not wet. Apply the amount of granulated organic fertilizer recommended for trees on the fertilizer container label. Spread the fertilizer out to the edge of the tree's drip line. The drip line is the place where the spread of the tree's foliage ends. This is the area where most of the tree's feeder roots are located. Add water over the fertilizer to wash it slightly into the soil around the tree roots. Some fertilizer will remain visible on the soil surface. Spread a 1-inch layer of compost over the soil and fertilizer followed by a 1- to 2-inch layer of mulch. Spread the compost and mulch over the entire root base of the tree and outward to slightly past the drip line. Provide shade or other protection for the tree if it is exposed to harsh afternoon sunlight or drying winds, especially in USDA horticultural zones 7 through 8. 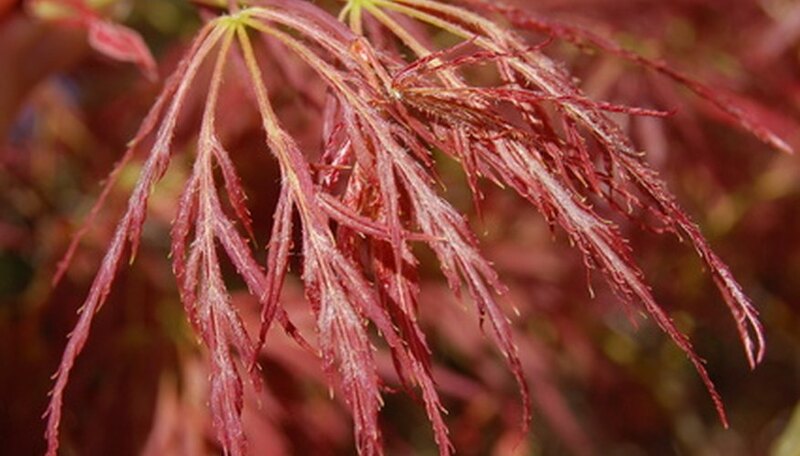 Japanese maples will suffer from leaf burn if exposed to hot sun or drying winds.